Current status: STOLEN! If you have seen this car, email me! This vehicle provides a definite answer to a question. The question is "Is it possible to go too far when souping up a radio controlled vehicle?" Gather round, children, and listen to my tale of foolishness. 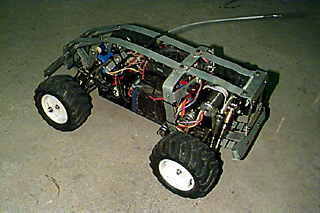 Based on a 1/7th scale Model Rectifier Corporation World Scale chassis, the Mammoth could have been a perfectly ordinary if rather large R/C racing truck. The World Scale chassis is unremarkable in all respects except size; it considerably outbulks the 1/10th scale trucks that are flung around dirt tracks the world over, but it's laid out the same way. Newbies who think radio controlled cars are the AA-cell powered things you buy at Radio Shack are generally startled by the sophistication and performance of the "serious" R/C toys that we bigger kids play with. 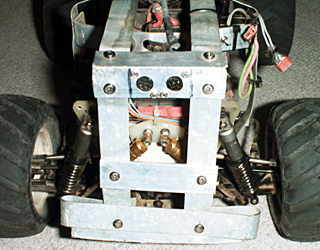 The World Scale chassis has four wheel independent suspension with adjustable upper links, lower A-arms and oil-filled coil-over dampers, rear wheel drive via a ball differential that provides a limited-slip function, and a slipper clutch that prevents too much torque being applied to the transmission. The only unusual transmission feature is the dual motor configuration - two regular 1.4 inch can R/C car motors are mounted on opposite sides of the spur gear, to give enough power to propel the heavier truck without trying to squeeze it all through one pinion-spur contact point. 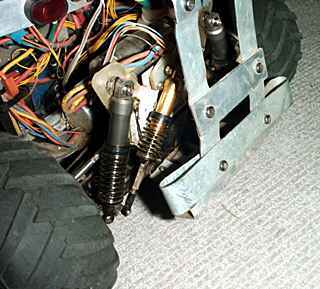 Likewise, the bellcrank steering can, and should, be pushed and pulled by two standard-sized servos. Topped off with a remarkable-only-for-its-size polycarbonate bodyshell, the World Scale trucks advanced the state of the art in radio control not one jot when they were released a few years ago. 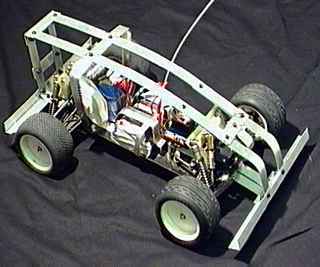 One day, I read an article in an R/C magazine about a World Scale buggy (same design, narrower front wheels) powered by an Aveox brushless aero motor. Aveox can sell their motors much better than I; suffice to say that for considerably more money they provide much higher efficiency and power than the brush motors used in regular R/C vehicles. Most Aveox motors are made to be used in electric powered aircraft, but some of the smaller models are suitable drop-in replacements for regular motors in terrestrial applications. Hmm, thought I. Y'know, you could put an Aveox in a World Scale chassis and power it with, say, 10 four amp hour D-size NiCd cells, and you'd have yourself a pretty speedy cruiser. But it's a dumb idea, said I, because Aveoxes are really expensive and you'd need a three channel radio if you wanted reverse (the special Aveox speed controller is reversible, but only via a jumper, so a separate switch is required), and the whole thing would probably end up being a great lumbering whale thanks to the mass of the giant battery pack. 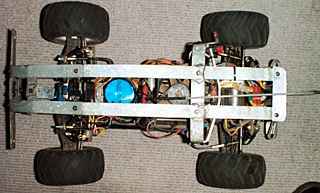 A few months later, I had a World Scale kit, an Aveox 1409/2Y motor and controller, a few extra shocks, a big pile of big NiCds, a very cramped work area and no memory of any of my previous misgivings. After considerable application of Dan's Basic Engineering Maxim - slap it together, bolt it on, if it doesn't fall off then it's meant to be there - and a degree of personal injury and profanity (note - do not silver solder with a butane torch anything directly above your bare foot), I had V1.0 of the Mammoth. I had foregone the usual polycarbonate body in favour of a bolted and silver-soldered rollcage, made from cheap hardware store mild steel strip. I had added at each corner one expensive gold anodised Associated coil-over damper to supplement the bigger dampers the kit came with. I had tried a Robbe monoswitch - a solid state gadget that clicks a relay according to the PWM servo-drive information from a radio receiver channel - for reversing the controller, but it turned out that the Futaba Field Force 3 radio I'd purchased had insufficient output throw to trip the monoswitch and so I made a simple microswitch-on-a-servo gadget to do reversing instead. "Beauty," I said, for I am Australian and we say things like "beauty" and "struth" and "fair dinkum". "This will be A Good Thing and Will Work Well," I went on to say. I was, of course, utterly wrong. Some of the problems with Mammoth 1.0 were minor. Those huge angle-iron bumpers were much too close to the ground (not helped by the low profile standard stadium racing tyres I was using), and collected about seven tenths of every green thing I drove the car over. 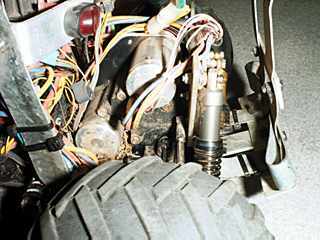 I mounted the front gold shocks with cylindrical bearings on the bottom link that had no misalignment tolerance, and the first good frontal impact broke the shock shafts. That sort of thing. Some of the problems with Mammoth 1.0, however, were not minor. The speed controller blowing up, for one. It blew up, it was (eventually) fixed by Alan, a cursing friend handier with a soldering iron than me; it blew up again. It blew up because the motor was overworked; it's good for more than 400 watts from 12 volts, but was having a hard time by itself. So I got another motor, and another controller, because you can't run more than one brushless motor from one controller. The plastic counter gear and centre diff gear were being destroyed every 20 minutes by the more-than-a-horsepower from the twin motors, so at fabulous expense I had them replaced with custom-machined steel gears. For the money, I could have bought a Sherline mill with indexing attachment and made the bloody things myself, after maybe two months of practice. I also replaced the front gold shocks with more big grey World Scale ones, added front and rear anti-roll bars that do a bit but not a lot, switched to high-profile tractor tread tyres, and rewired the battery pack so six little wires come out of each half of the pack and terminate in DIN sockets on the back of the roll cage, into which I can plug nifty little resistor packs and cell-by-cell discharge the main pack, should the urge strike me. LED headlights and a blue strobe light also joined the fun; some of the older pics on this page don't feature the strobe. One way or another, I wound up with Mammoth 2.0. Front end detail. Observe the beefy front sway bar's end poking out between the two right-hand shocks into the pushbar screwed to the right A-arm, and the centre-mounted receiver battery pack. The old Aveox controllers in the Mammoth don't have a BEC (Battery Eliminator Circuit), so I use a separate 5 cell 1400mAh pack to run the receiver and servos. 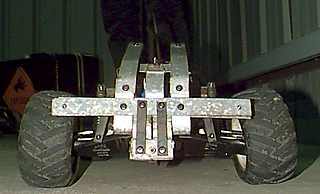 Rear end detail. Observe the steeply canted standard size Associated gold shock (with absolute maximum preload on the absolute maximum stiffness spring). Observe also the charmingly hand-crafted appearance of the back of the roll cage, which looks like this because it's been very, very bent very, very often. 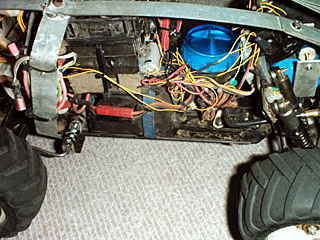 The roll cage has frequently been bent far enough that it turns off the BRS visible at the top of the picture. Left side view. Observe stunningly elegant ratnest of wiring. This gives a good side view of the battery pack - the thing held to the chassis with the blue strap at right of frame - and the two speed controllers and their heat sink on top of it. You can also see some of the fan atop the heat sink. The fan is there for a reason. Right side view. More disgusting wiring Alan wouldn't approve of (anything neat in the Mammoth was wired by him, including the spiffy DB9 connector that ties together all of the low current stuff). Observe the two Deans Ultra Plug sockets hanging in the breeze of the left-of-frame roll cage support; they're for charging the power and receiver battery packs. 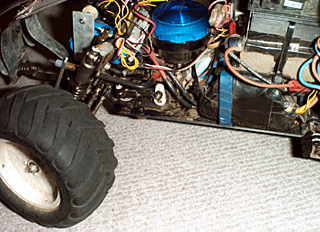 Another good view of the Tower Of Power in the middle of the chassis. Observe funny little toilet roll thing holding down receiver pack. I made it as a hold-down that wouldn't cut into the pack at about three in the morning one day, and since it works perfectly I've never got round to changing it for something less preposterous. Observe, also, strange ugly mount for rear sway bar. The rear sway bar is really too thin to do anything much. The motors. Aveox 1409/2Ys. The spur gear is on the far side of the plate the motors mount to. The back of the beast, showing off the two six pin DIN sockets I can use to discharge the pack. The correct way to completely discharge a NiCd pack to zero volts is cell-by-cell, with a resistor across each cell, so stronger cells cannot "reverse" weaker cells that go flat before them. Don't believe the hype about discharging - I do it when I bloody well feel like it. Memory effect's a crock, unsupported by evidence. Nyaah. 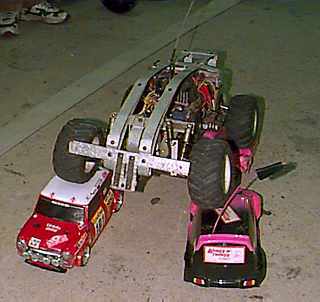 Here you see the Mammoth asserting its territorial dominance over some Tamiya 1/10th scale M-Chassis cars. The Mammoth looks impressive, and makes a bitchin' noise as it hares past at its top speed of 50 km/h. The steel transmission gives a lovely snarl during braking (like all small electric R/C cars, the Mammoth brakes through the whole transmission; it's two-wheel-drive and two-wheel-brake). 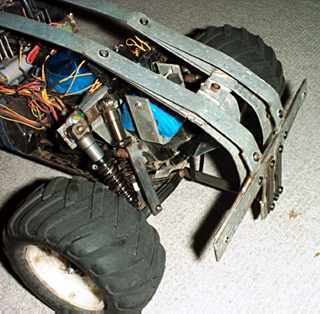 It does magnificent sideways sliding braking maneuvers, shin-punishing rock-shifting circlework, and provides a brutally immovable object for smaller cars to accidentally cross paths with. It is, however, not particularly nimble. The steering has a mile of slop and the servos are none too fast, the 20lb weight of the vehicle (five times the mass of an ordinary 1/10th scale racing truck) and its relatively low-traction tyres make it feel as if it's driving on ice, and it's good that it stops well sideways because it sure as hell doesn't stop well in a straight line. It took a huge amount of irritation and expense to make this thing work as well as it does, and, really, that's not very well. I love to tinker, and this toy provided a ton of tinker-fun. But, when it was "done", I felt I needed more. Got a question? Got a comment? Got time on your hands and just want to send an inane message to some guy you've never met? Email me!